I’m going bite-sized today. That’s bite-sized in terms of the blog post, not in terms of food. I rarely go bite-sized when it comes to dinner. Unless we’re talking elephant, or in this case very large bull, size bites. When the nights close in we seem to become unaccountably busy, at both work and play. And sometimes, just sometimes, I may not have the time, or energy, to cook a proper dinner. Thank goodness for leftovers. This is where being something of a glutton comes in handy. I always make too much food. I really can’t be bothered with halving recipes for 4-6 people just because there are only two of us eating. And besides, you never know who might pop round for dinner. And so our wee fridge fills up very quickly with all manner of food. This weekend yielded some left over ragu and a third of a jar of mustard. I found some potatoes that had been lurking in a box on the floor nearby for a couple of weeks. Time for some cottage pie-ing. Like any slow cooked food, the beef ragu (or chilli, stew, curry, whatever) benefits from a day or more in the fridge. Maturing. Which is why leftovers are ideal. They’ve usually been left hanging round for at least a day or two. Plonk your beef in an oven-proof dish. Boil and mash some spuds, add a few spoonfuls of mustard, beat them smooth with a wooden spoon and smear them over the beef. Whack everything in the oven for an hour at 180-200oC and you have a hearty dish fit for a king. Or queen. This looks delicious! 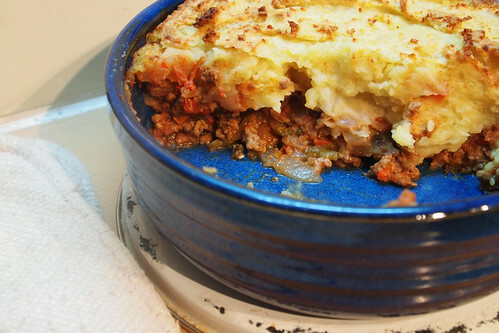 And the more food the better: leftovers like this cottage pie taste amazing, I’m sure. Your beef ragu looks ACE. You’re right, the best thing to do with leftovers is to use them to create something entirely new and equally delicious. @Paul – thanks, simple works so well with leftovers, i mean, you’ve already done the hard work, right? @Susan – why thank you! Leftovers always make the best meals. 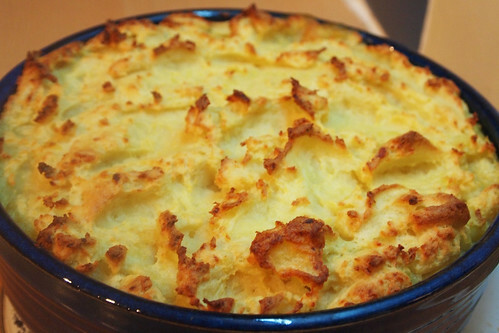 Think shepherds pie as well …..